The heat. Oh, God, the heat. I now know why Parisians flee the city in August, sleep till 2pm, and stay up socializing until 3am. 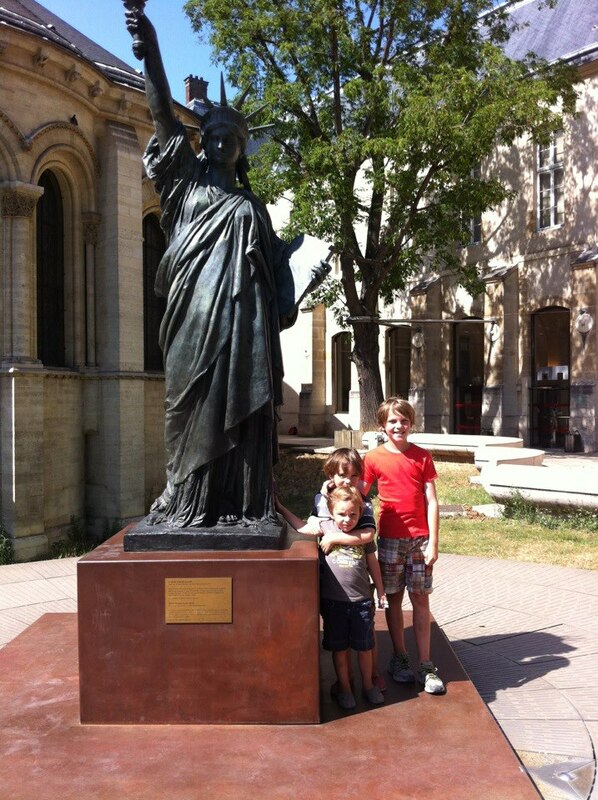 To escape the heat yesterday, we took the boys to the amazing Arts et Métier museum – an undiscovered gem not far from our place. This museum has every kind of mechanical device you can imagine – radios, tvs, old computers, weaving looms, spy camera, printing presses, airplanes. It’s a “machine” kid’s heaven. Oh yeah. It has a few Statue of Liberties, too. Today, it hit over 100 degrees, and nearly no shops, cafes, or houses have air conditioning. Bug, the boys, and I plunked down in front of a fan and watched a movie. After it was over, our 8 year old asked if he could go over to the playground since it had cooled off. We said “yes” since it was nearly 7:30 and the park closes at 8:30. And by closes, I mean a woman comes around with a whistle, blows it, and everyone files out. It’s kind of awesome. We told Pudge to go with him and we stayed home with the Colonel who had been vomiting all day. The park is two blocks from our place. No big deal. About fifteen minutes after they left, someone began pounding on our door. It was Pudge saying the The Fox had fallen from “Way up on the structure. I think his arm is broken.” Bug took off running, in his PJs, to the park. He called me a few minutes later saying I needed to bring his wallet and passport – an ambulance was on its way. My last experience with an ambulance was Bug’s accident when a man called to say my husband had been hit by a truck and was pinned beneath the wheel. I am not a fan of ambulances. I shoved the Colonel into his shoes and raced to the playground, arriving just when the ambulance did. The Fox was on his back, surrounded by adults, not crying, but not really doing anything either. He had fallen about eleven feet off the top of the open slide thing. The sight of the ambulance triggered a mild flashback in Bug. As much as he wanted to help The Fox, he couldn’t because he was struggling with not losing it – especially when they began to stabilize his neck. That, combined with his inability to speak French, meant I was on ambulance and hospital duty. We were fairly confident his arm was broken, and my sweet little guy was crying – not from pain – but because it’s his right hand and he was worried he wouldn’t be able to write. He begged the doctor to please “Save my fingers,” which she promised she would. And she did. His fingers are completely free and despite not being able to move his thumb before surgery, he woke up a little and wiggled it. I’d like to take a moment to say that the staff of Necker-Enfants is wonderful. It was the most efficient, well-organized, and fast emergency room I’ve ever been in. The staff didn’t speak much English, but they took their time to explain everything to me and The Fox. They worked hard to make sure he was comfortable and happy. Basically, they put a very scared eight-year-old at ease, and within an hour-and-half of admittance, he was in surgery. No waiting for approvals or filling out forms. It was general exam, x-ray, and we’re off to surgery. The Fox has to stay one, possibly two, nights for observation, but we hope he can come home tomorrow. And here he is post-surgery, resting. Oh that poor little boy! 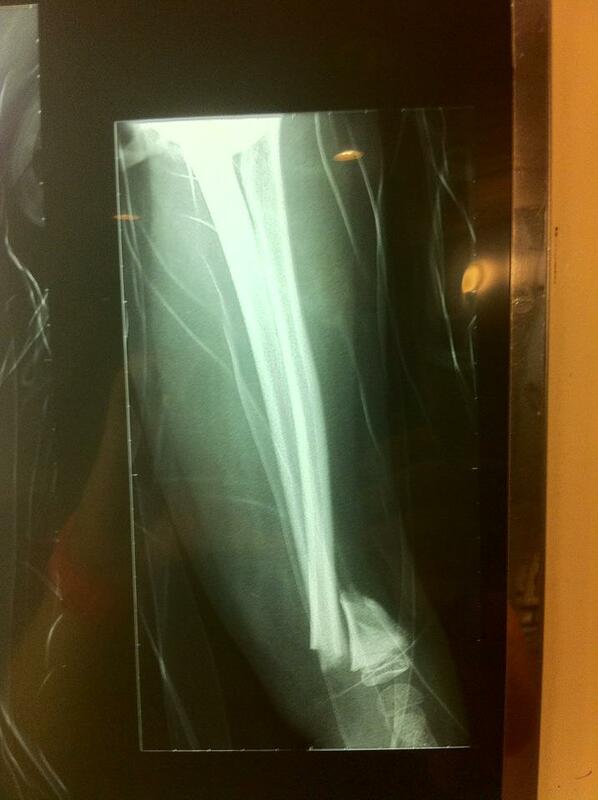 That looks like a nasty break! And no crying?! poor guy. 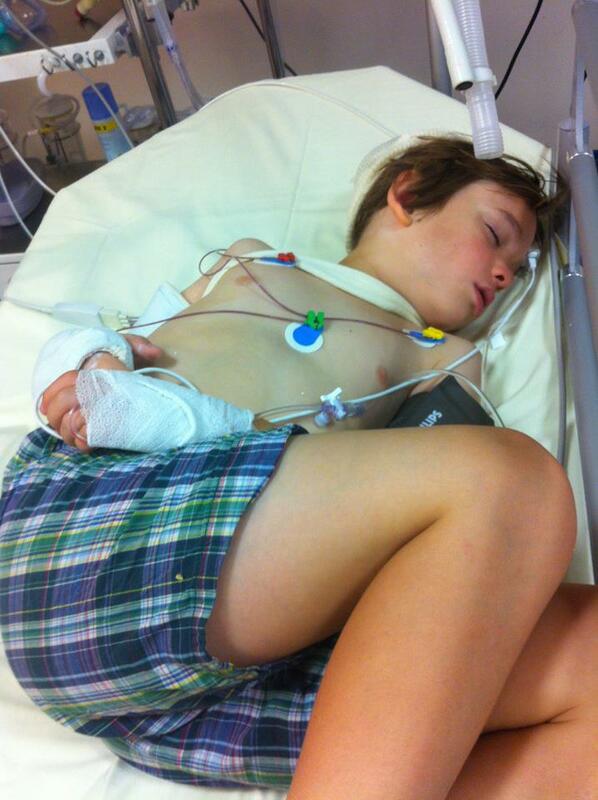 And Pudge- how scaredhe must have been for his little brother and how brave and fast thinking to run get help.